We buy junk cars for cash in New Jersey! We provide the fastest cash for junk car service in New Jersey. New Jerseyans are tough, no-nonsense people who won’t put up with any malarkey. That’s why when The Clunker Junker pays cash for cars in New Jersey, we do it quickly and efficiently, without any of the hassle usually involved with selling a junk car to a private buyer. We’ll never try and yank your chain by giving you one offer and then trying to change it when we arrive to pick the car up. We’re not like the jabronis down at the auto salvage yard! Whether you’re down the Jersey Shore or inland towards Trenton, we buy junk cars in New Jersey no matter where they are or what condition they are in. Not only that, but all of our offers included free junk car removal, so you never have to pay for towing like many of the other guys. If you car was wrecked on the Garden State Parkway or New Jersey Turnpike, or it broke down on your staycation in Atlantic City, we’ll make an offer on the car and get it out of your hands as quickly as possible. Even if it’s uglier than the New Jersey Devil, we’ll still be happy to buy it. Our New Jersey junk car buyer will arrive at your location, pay you cash for your junk car, and bada-bing bada-boom, the car is gone and you have some extra cash in your pocket. Think you can get a better deal by selling your junk car on Craigslist instead? Fuhgeddaboudit! It’s full of time wasters who want to low ball you, then never show up when they said they would. We buy junk cars in New Jersey right now, and in many cases we can remove your car and pay you cash within one to three business days. Sometimes our team can even get it done in a single day! Whether you’re looking to junk your handed-down Chevrolet or few-years-old Cadillac, make sure you know some details about your vehicle in order to sell your junk car in New Jersey. First, tell us the exact year, make, and model of the car you want to junk. These facts will provide us with a general idea of how much we can offer you, before asking about its condition. Like the cash offer we’re able to give you? Next, just click “accept”! We may at this point ask for picture-proof of ownership, but that’s generally not the case. Once accepted we'll get you connected to our New Jersey junk car buyers right away to schedule a time for pickup. After you agree to the cash offer, we’ll schedule your vehicle for pick up within three working days or less in many cases. When the driver comes to your front doormat, he or she will give you your cash or check payment for your keys, title (if required), and vehicle. Towing is always free, so expect no hidden surprise fees! So how much can you sell a junk car for in New Jersey? We buy junk cars in New Jersey, and virtually every junker that comes our way is accepted. However, we do separate our junk cars into three separate groups when we figure out how much to offer you. Is your car growing vines out of its open windows? Well if that’s the case, it probably belongs in our first category of automotive misfits. These clunkers will probably be recycled by New Jersey junk car buyers and junk yards for raw materials, so size and weight of the vehicle will determine the price. For these glorified greenhouses, you might expect a $50 to $275 payment from us before we take it to an auto salvage yard. But for the “in-betweeners” that aren’t sheltering weeds, we can still probably salvage parts from them. These cars are hard to price, but you can expect us to pay more for these than those car-sized greenhouses we mentioned in our first category. If you’re still able to do runs to the gardening store in your car, then it probably isn’t exactly junk. But that doesn’t mean we won’t take it! For vehicles that still have good years ahead of them, we can pay anywhere from $200 to $10,000 for such a car. 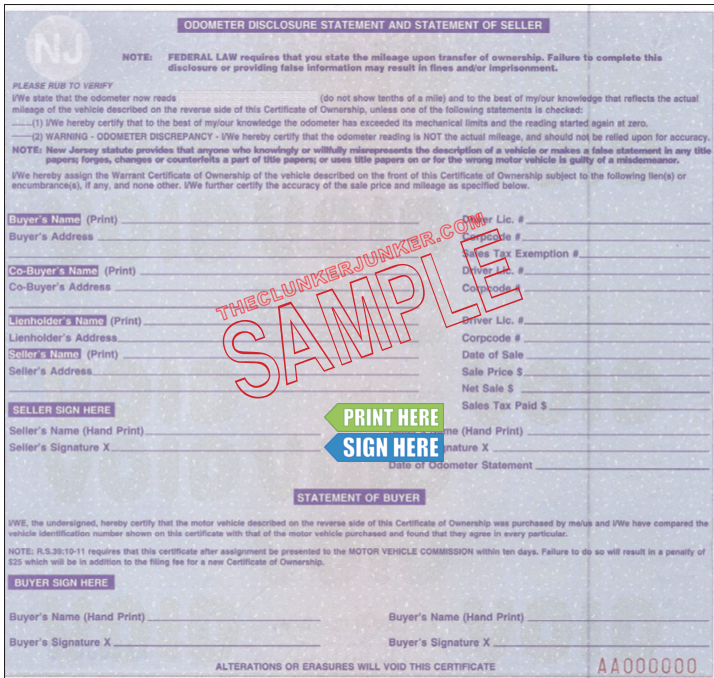 We have put together a simple guide and example for how to sign your New Jersey title when you are selling your vehicle. If there are multiple owners listed on the title, they must all sign the title unless the names are separated with "OR". You'll want to sign and print your name on the back of your New Jersey title where it says "Seller sign here". Make sure you're not writing anything in the "Statement of buyer" section at the bottom. First, print (don't sign) your name on the back of the title where it reads "Seller's name (hand print)". Next, sign the back of the title where indicated by "Seller's signature". 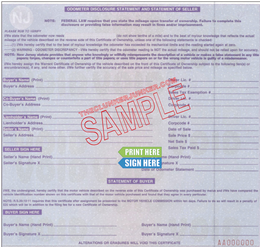 Fill out the New Jersey Application for Duplicate Certificate of Ownership. Please note that there may be a waiting period before a duplicate title can be issued and the cost is $60.00. (Paid to the NJ MVC). Getting rid of an abandoned vehicle in New Jersey can be a difficult process. Unfortunately, you cannot just sell any junk car that ends up on your property if you do not own it. You'll need to follow the New Jersey abandoned vehicle removal procedures. We have given a general overview of what that entails below. By law, all abandoned vehicles must be put up for public sale/auction. However if a sale cannot be completed through an auction the property owner may apply for a title in their name only. To sell an abandoned vehicle on your property, you must submit an Application for Certificate of Ownership for a Vehicle Abandoned on Private Property (OS/SS-137). This may be used in lieu of title for use in selling the abandoned vehicle. To qualify for the submission of application, you must first follow the Abandoned Vehicle Checklist to obtain all necessary documentation to have the vehicle sold. Once all required steps are completed and the application is submitted, the owner of the private property will be issued a title for sale of the vehicle. Do you buy cars with no title in New Jersey? Yes! We have purchased many vehicles in New Jersey without the title. That does not mean we can always buy every car, however. Without the title you should expect your offer to be lower and you’ll be asked to provide photo identification and a matching valid registration to prove that you own the vehicle. 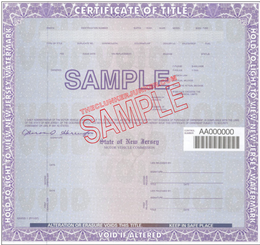 New Jersey often changes their title documents from year to year. 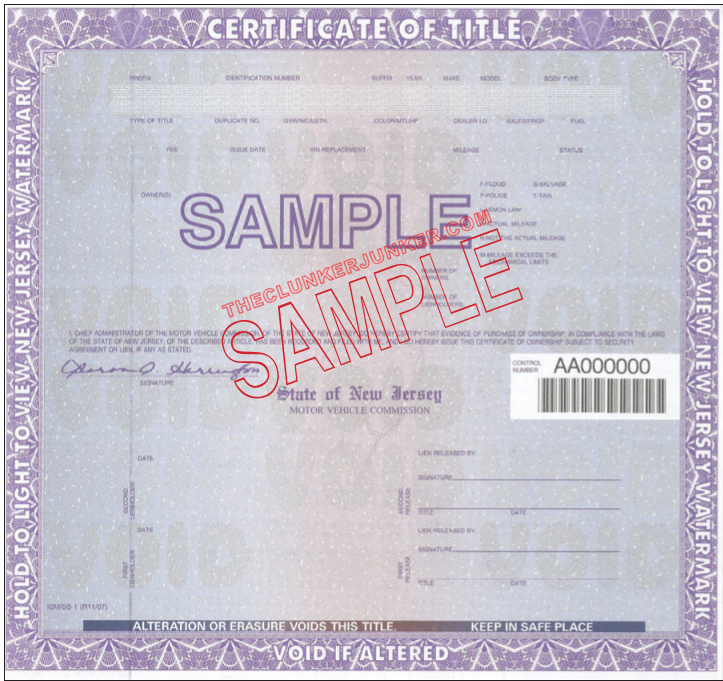 If you have questions about your specific title, please contact your New Jersey MVC. Yes, unless you are transferring the plates to a new vehicle. You can return the plates to your local MVC office. You may need to notify your local MVC that you have sold the vehicle. You can contact them with any additional questions or concerns about the transfer of your title. Before you go drive your old Acura into Lake Hopatcong, get in touch with The Clunker Junker. We’ll take almost any NJ junker off your hands, and give you the cash you need—on the spot. "The car might run but my key broke in half a while ago. I have both halves. It hasn't been started in a while. The passenger side mirror is there but it is hanging a bit." "The vehicle is currently located at my mechanic's shop. The title is in the mail, and I should have it shortly. I do need the car removed ASAP. Thanks. " "The vehicle's rear wheel cylinders were replaced in the past year. The radiator, water pump, alternator, battery, front and rear brake pads, front rotors, and both headlights were replaced in the last six months." "I have two vehicles that are the same make, model and year. The owner is in an assisted living facility now and cannot drive. He has signed the titles for disposal. I am his son and have the power of attorney to dispose of these vehicles. Both engines would start as of several months ago. I'm not sure if they would now. There's no battery or the batteries are not charged. One could not pass inspection due to an under-dash wire harness short. Basically, both vehicles have all four wheels and will roll. All engines, transmissions, fenders, hoods, trunk lids and glass are intact. They're missing some headlights/taillights. These are vehicles considered for scrapping. " "I'm no longer able to drive. The vehicle needs work that I'm unable to pay for. It has been just sitting in the driveway for three-plus years. I was told that it needed a water pump, the A/C does not work, it has a dead battery, and it has flattened tires from sitting." "The vehicle's headlight burnt out, the driver door sticks, the driver window is off of the track, so doesn't fully close. There's a dent in the passenger door. A fog light is missing. It runs well, and I have both of the keys and the owners manual. " The Clunker Junker is one of the top junk car buyers in the state of New Jersey. To date we have made instant offers on over 20 thousand vehicles across the state, totaling over $5.6 Million offered! Of those vehicles, approximately 8% were purchased without a title. We also buy cars on a wide spectrum of conditions and 47% of the vehicles we've made offers on in New Jersey do not start or drive. Many also have moderate to severe body damage. Trenton in Gilchrist County was our top producer, followed by Newark.